As we near the half-way point of the season, Rabbitohs NYC (under 20s) coach, David Penna, provides an update on the progress of the Club's young-guns playing in the Holden Cup. After 11 games, Penna's side sits in 11th spot on the competition ladder with eight points, having scored four wins thus far, and with the inclusion of a number of players from the Club's talented SG Ball (under 18s) side complementing his troops, Penna has every reason for optimism. "We started the season really well," said Penna. "We've got a lot of injuries – we had a tough period, but (the) last couple of weeks things have turned around and a lot of the new boys have come up from the SG Ball side, who had a really successful season. "They've added that little bit of energy and excitement back to the team – and we're starting to get dribs of boys back. "I'm hoping this sort of next five rounds we can really start to play some good football." Penna praised the efforts of his under 18s graduates, who came into the side following a Preliminary Finals berth under the tutelage of former Rabbitoh, Blues and Test winger, Matt King. "They have made a massive difference to our side," said Penna. "There's some terrific young players there and that little bit of youth and experience that (makes) a good football team. "We're trying hard and the boys are working hard." Just like the Club's first grade side, Penna's team will enjoy the bye in Round 12, and have begun preparations for their Round 13 clash against the Gold Coast Titans at North Sydney Oval in what will be a rare chance to play afternoon football. "Hopefully the fans who can't get to Perth will come to North Sydney Oval," enthused Penna. "Both our sides (Bears and 20s) are there and it's going to be a great afternoon – it's been a long time since I've had a one o'clock game on a Saturday, so I'm really looking forward to it." The Rabbitohs NYC side will take on the Gold Coast Titans on Saturday 4 June at North Sydney Oval, with kick-off slated for 1pm. If you need your Rabbitohs footy fix next weekend, come and cheer on the future starts of our Club at North Sydney Oval! Vivid Sydney 2016 is a 23-day festival of light, music and ideas. 4,500 additional public transport services will be running across the 23 days of the event to help people travel to and from Vivid Sydney. Parking will be limited and you will not be able to see most Vivid Sydney events from a vehicle. Avoid the traffic, leave the car at home and take advantage of the extra public transport services running. Large crowds are expected in the city throughout the event, especially on Friday and Saturday nights. I'm planning to get to NSO next week. It'll be a great weekend - Radio Birdman on Friday night (yeah hup) and North Sydney on Saturday afternoon. NS v Wyong should be a good game. Wyong has just lost to Illawarra 26-22 with Illawarra scoring a try under the posts just before full time. On the table, NS is 6th on 16pts, while Wyong is 7th on 12pts (noting that NS has had two byes compared with just one for Wyong). It has potential for a great game. Illawarra's win mean that it moved to 4th (16pts, but with a better F&A than both Wests Tigers and NS). It'll be good to see the South Sydney U20s as well. Bears fans should have an interest in this squad as at least a couple of them - Tevita Cottrell and Siosifa Talakai - have been playing for North Sydney. I expect that there will be others before the end of the year. Fresh off the bye the North Sydney Bears are looking to keep the winning run going when they take on Wyong this Saturday at North Sydney Oval. The Holden Cup under 20s match between the Rabbitohs and Titans will be on Saturday 4 June at 1pm at North Sydney Oval. A few ex-Bears in the Wyong lineup. It was only a few weeks ago - Round 9 - that I saw North Sydney play in Moss Vale. Nine players who were named in that squad aren't listed this week - Jack GOSIEWSKI, Tom HUGHES, Samisoni LANGI, Jordan LATHAM, Michael OLDFIELD, Patrice SIOLO, Siosifa TALAKAI, Cody WALKER and Cheyne WHITELAW. There are also three positional changes - Moceidreke (from fullback to 5/8), Williams (from prop to lock) and Rogers (from bench to second row). A radically different side. Gosiewski and Walker are named for South Sydney NRL this week - to be honest, I didn't think any of the team who played in Moss Vale deserved to be picked for Souths. Given how badly South Sydney was playing, I would have thought it was a chance to stake a claim for first grade selection, but none of the North Sydney players put in performances that demanded they be picked. I'm pleased that this seems to have turned around. 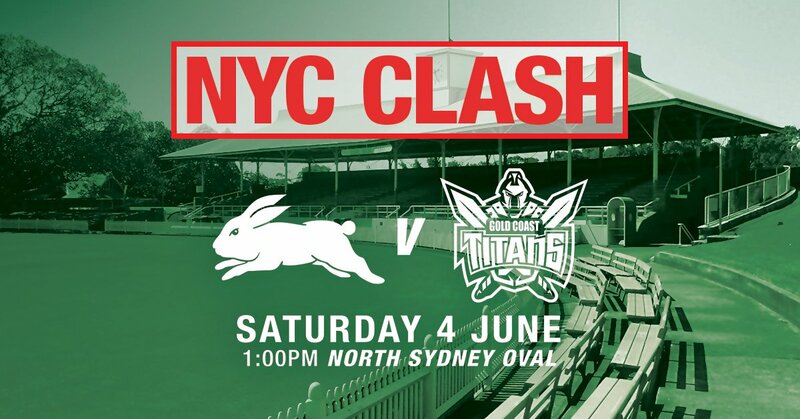 The #NYC Rabbitohs are facing the @GCTitans on Saturday at North Sydney Oval! The South Sydney Rabbitohs NYC (under 20s) side will take on the Gold Coast Titans while our NSW ISP side, the North Sydney Bears, will take on the Wyong Roos at North Sydney Oval this Saturday June 4. Warm up for Sunday’s NRL game by getting down to North Sydney Oval on Saturday to cheer on the future stars of the Club, as they chase crucial points in their respective competitions. The Wyong Roos put in a dominant second half performance to down the North Sydney Bears 30-4 in torrential conditions at North Sydney Oval. Both sides completed near the mid-60 per cent mark, struggling to maintain possession thanks to the conditions, but it was North Sydney who struggled the most throughout the contest, failing to get a grasp on the game with their lack of field position and limited try-scoring opportunities. Wyong, meanwhile, controlled the game from the get-go thanks to wonderful performances by Tyler Cornish, Mitch Williams and Abraham Papalii. Wyong had the first opportunity of the afternoon when Williams threaded a grubber in from dummy half, but Zane Tetevano could not ground the ball. After a forced dropout thanks to a smart kick by Omar Slaimankhel, Williams was put another grubber through that deflected off Sitiveni Moceidreke, and with a bit of luck, got a second boot to the ball into the in-goal and planted the ball down himself to score the first try of the match. Wyong dominated field position for most of the first half, but North Sydney had four consecutive repeat sets attacking the Roos’ line. The Roos’ defence held strong, however, and a Moceidreke forward pass with only a minute remaining on the clock let Wyong off the hook, and meaning they led 6-0 at half-time. Jayden Nikorima got ever so close just minutes into the second half, when Cornish put in a perfect grubber, but Latrell Schaumkel swatted the ball out of the would-be try-scorer’s grasp at the last second. The only thing that could have stopped Nikorima in his next chance was a torn hamstring soon after when Moceidreke put a grubber through, it was deflected off a Roos’ player and the young half darted 80 metres up-field to score. As he was about to score the try, he pulled up short and clutched at his hamstring, but still made it to the line. As the rain began to vigorously pelt down, the Roos extended their lead to 18-0 after a left-to-ride mid-field shift created an overlap and allowed Dominic Reardon to score, before Cornish slotted a beautiful conversion from the sideline in tough conditions. The Bears had a sniff of comeback with an unconverted try to Tevita Cottrell in the corner, but Papalii was rewarded for a powerhouse performance with a strong try in the final 10 minutes, increasing the Roos’ lead to 24-4. Cornish kicked an amazing 40/20 in the dying minutes and was nailed by a Bears defender in the process, and scored off the back of that with a show and go on the buzzer to win the game 30-4.